When one thinks about the function their kidneys serve, they are most likely going to think about the removal of urine. What might come as a surprise is that, using a tiny filter called nephrons, the kidneys actually filter all of the blood in the human body. In fact, your kidneys are able to filter two hundred quarts of blood in a twenty-four hour period. Kidneys also take the job of regulating your salt, internal acids, and potassium. 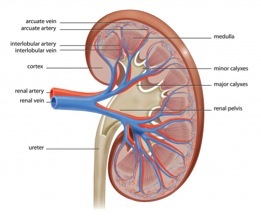 The kidney also helps regulate blood pressure and red blood cell production, with the hormones it releases. If one is properly hydrated, the kidney is able to remove up to two quarts of urine. Kidney stones are one of the most common kidney problems. They accumulate from a build up of waste in urine, often caused by dehydration. Slowly, over time, waste builds up, like a pearl in an oyster, into a stone. In most cases clearing a kidney stone is as simple as staying well hydrated. Once a kidney stone has been created it will work its way down the urinary tract, and if small enough be passed with one’s urine. However if a kidney stone is too large to pass, it can clog the urinary tract, causing waste to build up in the ureter, bladder and kidney. Stone blockages are usually dealt with by using shock waves to destroy the stone. However, in extreme cases blockages are dealt with by performing surgery to remove to stones. Large kidney stones can be very painful. 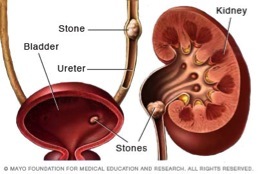 The pain, sickness, and extreme discomfort that can come from a large kidney stone can be difficult to understand for the person suffering from them, and difficult for a doctor to diagnose. Severe pain on the lower side of one’s back, bloody urine, and foul smelling urine can all be a sign of kidney problems and a kidney stone. What may surprise is the nausea, feverish chills and even vomiting that can come with having a kidney stone. Once a kidney stone is identified as the source of the problem, strong pain killers are used to relieve the pain until the stone can be passed, or removed. Basic healthy living habits can keep most people free of any stones. The easiest way to avoid having kidney stones is being well hydrated. While sugar and high-fructose corn syrup can increase your risk of kidney stones, salt is largest danger. Unfortunately salt can be found in more food then you would expect. Canned and cured foods are high in sodium; even sports beverages and instant lemonade can be responsible for a kidney stone if not regulated. Chronic kidney disease, of CKD, is a more serious problem. Despite what the name suggests, it is actually not a disease. 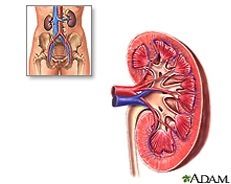 CKD is when a kidney is damaged and becomes unable to filter blood properly. Chronic kidney disease can be avoided by regulating high blood pressure and diabetes if one has such afflictions. Anyone hoping to keep their kidneys in top shape should also remember to regulate their blood pressure. While medicine exists to help fight kidney disease that does not guarantee one can avoid kidney failure. Sadly when kidney failure does strike, and both kidneys have failed, dialysis is required unless or until a transplant can be found. Dialysis is the process of using something other then one’s kidneys to fill the role of filtering water and waist from your blood. If you find yourself in need of dialysis, there are two types very effective types: hemodialysis and peritoneal. 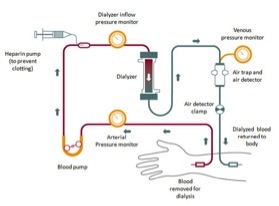 The hemodialysis process of dialysis, is done by being using a machine that works like a kidney. The machine takes in blood, filters it and then puts it back into the body. This process is done three times a week, for three or four hours and can even be done at home. Peritoneal dialysis uses the abdominal lining as a filter. When the abdomen is filled with liquid that absorbs waist, the liquid passes into the blood vessels and is later drained away, carrying the waist. This kind of dialysis can also be done at home and is most often done while people are sleeping. To avoid kidney disease and failure one must remember the importance of early detection. When one’s kidney takes damage the result can be blood in the urine, bubbly urine, or inconsistent urination rates. Not all kidney problems are as easy to identify, often because there are many symptoms that one would not expect having anything to do with there kidneys. For example, a build up of fluid the body can result in swelling in one’s face, feet and hands. Anemia can also cause kidney failure. Anemia based kidney failure results in feeling weak, cold or even pica, the phenomenon of craving dirt, clay, ice or laundry starch. Regardless of what traits one finds themselves possessing if a person suspects themselves of having kidney problems it is important to list any problems or symptoms they are having, to help a doctor identify what is wrong and whether it is a problem with the kidney. Keeping one’s kidneys healthy requires more then just water and avoiding salty foods. Alcohol is not just bad for your liver, alcoholic beverages raise one’s blood pressure and should not be consumed in large quantities. Tobacco much like alcohol also should be avoided, and in the case of tobacco, entirely if possible. High cholesterol can cause diabetic related kidney problems to accelerate. To keep a healthy kidney the most important thing to remember is to drink water and keep a healthy vascular system, be physically active, and having a healthy weight. In the end regardless of what kidney problems one faces a basic healthy life style is all that one needs to avoid most complications. This was a very informative article. It is one thing to know you should drink water but it is another to know the reasons. I appreciated the clarity of the writing in presenting the facts. I can see the research that went into it.